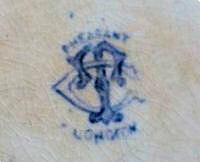 The works appear to have been established in 1856 by a previous pottery factory owner. 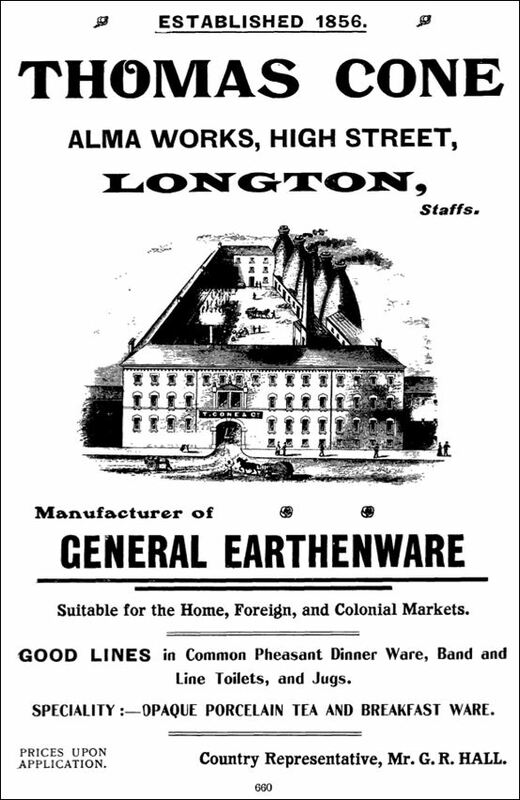 About 1920 the business was acquired by Thomas C Wild & Sons and was renamed Thomas Cone (Longton) Ltd.
Pottery factory exterior including bottle ovens, which are in the process of being demolished. 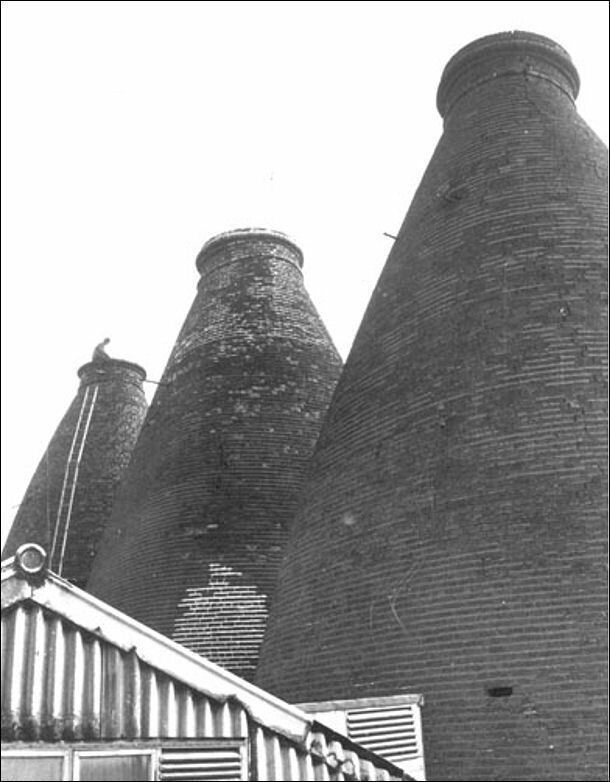 Due to the proximity of other buildings the first of the three bottle ovens is being dismantled brick by brick. 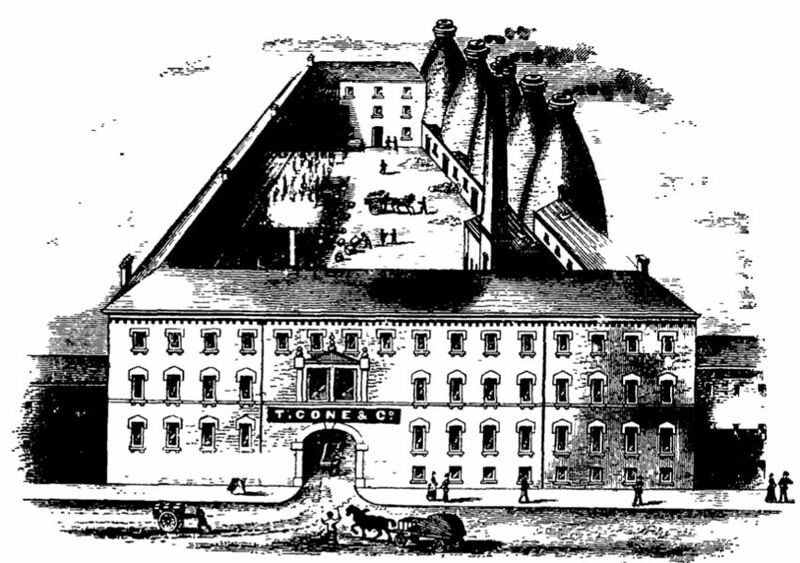 making company - they purchased the site to extend their own factory. The old biscuit bottle ovens were the hot throbbing heart of our pottery factory. They were mother figures to those who worked on this or any other pot bank. Big, imposing matrons in full dresses of brown bombazine, their ample wombs weekly brought forth the product of our labour. They followed a 14 day cycle: six days to fill, three days to fire, three days to soak and cool, a day to empty, and a day to repair the internal-brickwork, mainly around the hottest parts (the gluts and the bags). Every clay piece made on the factory had to be fired in one of our two biscuit ovens. Absolutely everything depended on the skills of the fireman and his mate. I had served my apprenticeship on a series of factories both ancient and modern, while sandwiching myself into a three year course at the North Staffs Technical College (I believe that it's a polytechnic now). People who get their qualifications by attending night schools have my enduring admiration. There is no harder way to learn, yet the encaustic tiled corridors of the old Stoke Tech were thronged each evening with workstained men, tired but determined to get the diploma that would qualify them to become pit deputies, pottery factory managers, engineers, accountants, and a hundred other things. Being a bright grammar school boy, I found examinations very much to my taste and did well at them. I had no doubt that, when I qualified, one of the modern factories would be put in my charge. Thomas Cone Ltd was old and run down. It was unclear whether I was sent there to test what I had learnt or to teach me a lesson. Our fireman was a red eyed, bloody-minded, unshaven, uncouth old drunk who could fire ovens as perfectly as the baker. On the night in question he lay down on 20 tons of best cobbles, freshly delivered from Florence Colliery, and died. Everything was ready for "kinding off." Dennis, the fireman's mate, had prepared each of the 12 firemouths with four hundredweight of coals topped off with a packet of firelighters and now stood, leaning on his shovel, awaiting orders. It seemed that life's dirty tricks department couldn't wait to expose my lack of practical experience. Firing that 100 year old bottle oven was a lasting lesson to me. For all my book learning I still had enough gumption to realise that bluffing was useless but that scattered through the workpeople around me there was a wealth of practical knowledge in small packets, willingly given if sought. Dennis, for example, knew how to prepare the firemouths and what the pace of the various phases of firing should be. He didn't know how to judge when these phases should start, but he knew where the Bullers' rings and Seger cones were that would give me that information. Arnold, the cod (chief) placer, had set out the bungs of saggers in the oven and these included the stacks of hollow fireclay saggers that formed the internal flues. He, above all, could tell me where the different types of clayware were placed inside this particular oven and what sort of firing he expected them to receive. Finally, Norman, the lodgeman, knew from looking back in the day book how much coal and of what grades the previous (now deceased) fireman had ordered. It looked as though he usually had 20 tons delivered at the outset and that this was usually sufficient. The first 36 hours were quite straightforward. Black smoke poured from our biscuit bottle oven and down Uttoxeter Road into Longton as the clayware slowly warmed and dried through the "watersmoke" period. Dennis was quite happy slowly feeding the smoky fires and catnapping on the coal. By the middle of the second day the kiln was black hot at about 800°C. It was time to open the dampers and send the draught roaring through the fires, down under the floor, up the flues among the wares, and out into the filthy sky that daily deposited one ton of grit per square mile of Stoke on Trent. "Dennis," I said, "It's time you saw an oven right through." I believe to this day that he had been waiting for this, and he certainly had a better idea of how to conduct the closing stages of firing than had been credited to him. Through that-long night I explained to him the theory of balancing the four quarters of the bottle oven so that the heat increased evenly throughout. He had never used the gauge for measuring Bullers' rings and it was necessary to explain the concept of the well fired pot as a product of time and temperature represented in these shrinking rings. We discussed the inevitable variations in temperature throughout the bottle oven and how one placed various types of pot so as to take best advantage of this (or, at least, to minimise this disadvantage). We agreed, as the dirty grey dawn appeared, that tunnel ovens would be a great improvement. Later in life I found sitting up with a biscuit oven to be similar to being the all night casualty officer in Edinburgh Royal Infirmary. It was boring and exciting by turns; too hot or too cold; the atmosphere depressing or evocative, according to your state of mind. The hood and hovel were stark, blackened brick, lit only by the orange glow of 12 hungry firemouths. 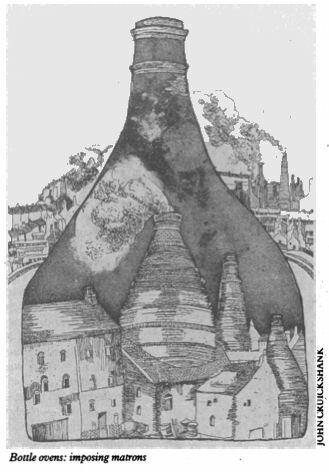 A cold moaning draught swept round the restricted space between the hood of the bottle oven and the circular beehive of the kiln itself, pulled by the throbbing, fiery furnace within. This monster, now that its fires were clear, ate coal at a prodigious rate, but we didn't dare fill a firemouth full for fear of drawing the balance of heat unevenly towards it. We sweated in front of the fires, but crept shivering back within seconds of stepping into the night air. We frowned and fumbled with the fireman's long trial rod, trying to lift Bullers' rings cleanly from the outermost saggers through a peephole, wrapping wet towels around our forearms against the yellow cone of heat blowing out of the small aperture. We worried and waited for measurements, exactly as, in later years, I would await the full dilatation of the cervix in the labour suite at Simpson's. The same responsibility lay with me at that moment, tempered by the same excitement of assisting in the final act of creation. As the unwashed dawn began to shroud the surrounding buildings in a decent curtain of mist the picket gate across the works yard banged open. Eli, the boilerman, always first in, came across to greet us with a small parcel wrapped in an old Evening Sentinel. breakfast," said Dennis, polishing his shovel, already shiny from scraping its way through 20 tons of coal. "It don't taste reet from a pan," said Eli, and he cooked our breakfast on Dennis's shovel, laid on the coals. He was right. Potters' breakfast never tasted so good. At eight we shut the dampers and closed the firedoors on each of the 12 firemouths. Dennis went home to bed while I settled into another busy day on the potbank. By six in the evening the last Seger cones had drooped, finally admitting that they had had enough heat. At eight the following morning I gingerly removed the first two bricks from the clammings, the temporary wall across the entrance to the bottle oven. A cold wind whistled into the hot kiln, causing a thousand small, sharp pingings to take up a thousand variable rhythms. To their staccato notes Dennis added a duller slower bass as he "punched' the oven, clearing the clinker from the firebars with a heavy steel rod that resembled the tillerpost of a trawler. By now the pottery inside the oven would be too cool for the fly ash to cling and stain. We pinned a cardboard notice to the factory gates: "Biscuit oven emtying [sic] on Thursday." One of the wittier graffiti artists corrected this, adding, "The P is silent, as in bath." At seven thirty on a cold, foggy morning our gang of casual labourers materialised. They were all freshly showered, straight from the night shift at Florence Colliery, but in their working gear they looked like a gang of pirates. They knew all about the irregular circumstances of this oven and shamelessly turned it to account by declaring it to be a "hot oven." There was nothing for it but to be first up the ladder inside the kiln and to place a thermometer atop the highest bung of saggers, 20 feet above the floor. They were right. I hadn't cooled the thing properly. The alternatives were bullying (not this bunch of toughs), persuasion (no, they'd got me and they knew it), or bribery, and the latter course was obvious. Seven years after entering the pottery industry I realised that the senior jobs in our business were passing to members of one family and that this process would continue until the cuckoos had displaced my father, my brother, and me. The difficult trading times that followed the Suez crisis destroyed my father's determination to risk his capital on an independent venture and nearly destroyed my own self confidence. Success in industry comes easily when your father is a senior director of the firm, but it is not clean won and lays no foundations. For the sake of my self esteem I needed to succeed in something desperately difficult. Medicine offered the most daunting challenge that I could imagine, but beyond the struggle lay the greatest prize that life could offer-independence.